With the interactive feature input control, you can add input features by clicking your mouse on the map display in ArcMap, ArcGlobe, or ArcScene. 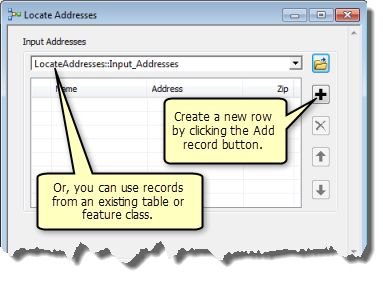 With the interactive record input control, you can interactively create records (rows) in a table. These interactive input controls are typically found in model and script tools that are authored by you or others in your organization (system tools, except those designed to be published to ArcGIS Server, do not use interactive inputs). The types of features that can be entered (points, lines, or polygons), as well as the attributes of the features or records, are defined and documented by the tool author using a well-established feature template. The interactive feature input control gives you two methods for inputting features to a tool—either by clicking on a map display or by providing an existing dataset. You can only choose one method—providing a feature layer or feature class, or interactively adding features. If you choose to provide existing features, only the features from the feature class or layer you specify will be used. 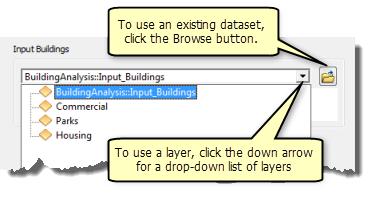 If the layer has selected features, only the selected features are used. To enter features interactively, click the symbol and start adding features to your map. Interactively adding features follows the same rules as making edits to existing data. You can change the default drawing tool while creating features, snap them to existing features, and add attributes using the Table window or the Attribute window. You have opened the tool from ArcCatalog and there is no map display where you can click to create a feature. You have opened the parameter while editing inside the ModelBuilder window. You cannot start a new edit session while a tool dialogbox with a feature set input is open. Additionally, you cannot end an existing edit session while a tool with a feature set is open. You must close or execute the tool before you can modify the edit session state. To modify the attributes of features you have created, open either the Table window of the layer inside the Table of Contents or the Attribute window and select the row for the new feature. Enter values into the fields for each feature. The symbology of features may change once you enter an attribute. 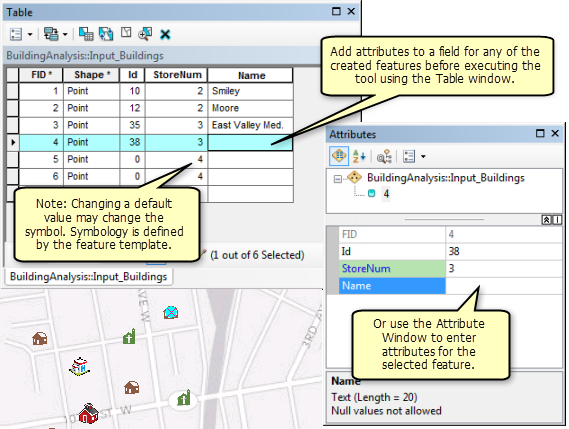 For example, the symbol for each building feature may change based on the value entered for the StoreNum attribute. The symbology of the added features is decided by the tool author through the feature template when the tool is created. As an alternative to adding attribute values after creating the features, you can set defaults for each feature you will create. By setting default attributes, all features you create will be created with the attribute values prepopulated. By right-clicking the feature inside the tool dialog box before the creation of any features, you open the Template Properties window; here you can change the default drawing tool and add default attributes. You cannot change the default drawing symbol or modify the geometry type. The available drawing tools are dependent on the geometry type of the feature. To use features from an existing feature class, use the drop-down arrow to select a layer from the map, or the browse button to search your disk. You can only choose a layer which matches the same geometry as the schema defined for the input features. For example, if your feature set allows you to enter points, polygon layers in your map will not be available as input to the parameter. If you choose to use features from an existing dataset, features that you entered interactively are ignored. The feature template defines both the shape type (points, lines, or polygons) as well as the attributes of the input features. Use caution when using a feature class that does not match the attribute schema of the feature template as input. The model or script you are executing may require fields to match the original fields for successful execution. You need to consult the tool documentation or the author of the tool to determine how to use feature classes with fields that do not match the feature template. Executing a tool in this situation could create default values and will execute correctly. Or it could be that the tool will fail because some (or all) of the fields need to exist. In ArcGIS 10.0, when using features from an existing feature class or layer, you may have received a warning about the mismatching schemas. This warning does not appear in ArcGIS 10.1. You can also use the mouse wheel to navigate while adding features. Roll to zoom in and out, drag to pan, and single-click to recenter the map. 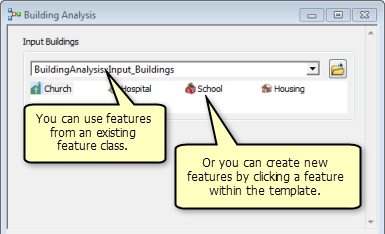 The input features added are saved to an in-memory feature class, which can be accessed via a result in the Results window. You can right-click the input parameter and Add to Display to add your interactive features to the map display. You can interactively create records for an input table using the interactive record input control. 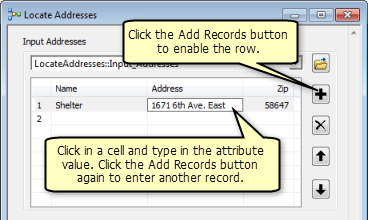 Check Add records, then click the Add record button to create a new record. You can only choose one method, either Add records or to use records from an existing table. If you choose to use records from an existing table, only the records from the feature class, layer, table, or table view you specify will be used. If the layer or table view has selected records, only the selected records are used. To use records from an existing table, use the drop-down arrow to select a table from the map, or the browse button to search your disk. If you choose to use records from an existing dataset, records that you entered interactively are ignored. The feature template defines the schema for the table. Use caution when using a table that does not match the template schema. The table and its schema you provide will be used as input. The model or script you are executing may require fields to match the original fields for successful execution. You need to consult the tool documentation or the author of the tool to determine how to handle using tables with schemas that don't match the original. Executing a tool in this situation could create default values and will execute correctly. Or it could be that the tool will fail because the fields need to exist. In ArcGIS 10.0, when using records from an existing table or table view, you may have received a warning about the mismatching schemas. The input records added are saved in an in-memory table. The input can be accessed via a result in the Results window and added to the table of contents of the application. You can right-click the input parameter and Add to Display to add your interactive records to the ArcMap table of contents, the same way you would add interactive features from the Results window.